March is National Reading Month! Polly at Helping Little Hands is hosting children's book Read Along this month. The Read along is to Share a favorite children's book and related activity(can be a art project, cooking activity, learning activity, Puppets). We are participating in the Read along and its an exciting experience to be joining in the fun. Do Come and check out all the great books and activities at Polly's blog Read-Along archive! Lots of Balloons, By Dana Meachen Rau is a story of a little girl who purchases balloons from a balloon vendor and shares the balloons with someone she meets. The little girl asks the balloons with an request, comparing the color of the balloon with something familiar, "May I have a balloon as red as an apple? ", "May I have a balloon as green as grass?" and she gives the balloons to a baby in a stroller, a hurt kid, people relaxing at the park by using the phrase "Here you go". Towards the end of the book, the little girl requests "May I have all of your balloons?" and the vendor says "I have no more balloons". The girl returns to the park and finds that everyone else in the park has the balloons she shared. The Story ends with the contented phrase from the girl "There are lots of balloon for everyone!" The short, simple sentences makes it a hit! Its an easy to read book with a list of simple words like May, have, go. The book also enforces the concept of sharing. CJ enjoyed every page of the book. One of the first things that caught my attention with this book is how the author associates the color of balloons with simple objects. I loved the characters too - little girl with yellow straw hat, A brightly dressed clown as the balloon vendor, an excited baby in a stroller. We also love the illustration of different color balloons in bright backdrops - When it comes to yellow balloons, the backdrop is illustrated with sun, sunflowers, Blue balloons with Blue sky backdrop, Green balloons with Grass bed in the background, Red balloons with Apple Orchard backdrop. Now days I'm trying to add more self reading, Phonic activities for CJ wherever possible so that she will learn words and recognize them. Since the book is about lots of Balloons and emphasizes on repetition of words, phrases, and sounds, we tried to read, craft and play around with balloons. All you need is a bag of assorted balloons, a Balloon pump, Paper, Hat. I created a image with the phrases like "May I have a Balloon as Red as Apple" and took print out of the image. I Cut the phrases as shown below. Folded the phrases and put them into a hat. Just as we do in lucky winner, CJ had to pick out one, one phrase from the hat and try reading it. We had fun reading it together. I gave her the balloon pump and a bag of balloons. 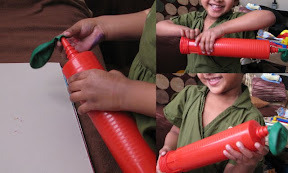 After she read the phrase, she inflated the corresponding color balloon and passed it on saying "Here you go". I knotted/tied the balloon to a straw so that it will be easy to hold and easy to store at the end of the day. We are planning to play the lucky dip activity several times this month. So that by the end of the month CJ will read few of the words for sure. CJ is obsessed of inflating balloons with pump so she had lots of fun blowing them. As I had told in one of my previous posts we recently bought a Cookie cutter set from Amazon. This cookie cutters and stencils are great. They are sturdy and heavy plastic so no worry about rusting. It works good to cut bread too. Because of the Jumbo size it serves multipurpose in kitchen and Crafts! We used this cookie cutters for the Balloon Painting. At the end of the activity 1, we had a bunch of inflated balloons. 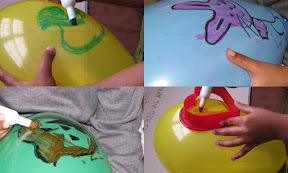 Using cookie cutters as stencils, CJ created images on the balloons using dry erase markers. We also did a reading activity by labeling the pictures and reading them. CJ got so involved in the labeling activity that she corrected me when I wrote orange pumpkin on the below balloon. She told mommy its an orange and black pumpkin. 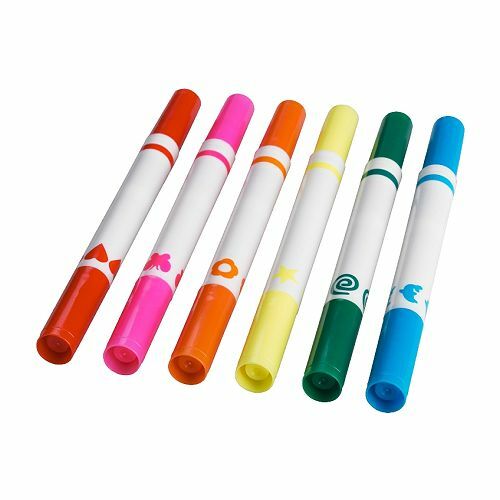 Recently we got this 6 pack felt tip pen/stamp from IKEA stores. Can you Paint/Stamp Hearts as Red as Apple? Can you Paint/stamp Spirals as Green as Grass? Can you Paint/Stamp Butterflies as Pink as flamingos? Can you Paint/Stamp Whales as Blue as sky? Can you Paint/Stamp Flowers as Orange as Pumpkin? Can you Paint/Stamp Stars as Yellow as Sun? We stamped on flat balloons because these markers were just pouring ink and they were taking time to dry. After the stamping fun, CJ inflated the balloons. 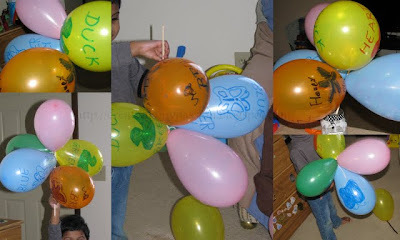 Though the designs were not very clearly seen in the inflated balloons, we had fun creating a different art work on the balloons. The poster colors didn't work out good on the balloons. I guess may be Acrylic paint will work out. She also used cookie cutter as stencils and painted. At the end of the day, though I had tied few of the balloons to straws, CJ left some of the balloons floating on the floor. So I tied them to a dowel stick and she had shake, shake, shake your balloons up and down fun! Tying the balloons together was easy way to store too! We liked the Dry Erase Marker painting the best! It works out just fine on the balloons. What do you think? THanks so much for sharing! My kids love anything that involves balloons. These are wonderful activities. What a great book to inspire so much art and reading and FUN! balloons are always a hit. love the ideas for stamping on them and using the cookie cutters for shape tracing! looks like lots of artsy fun! I love all your stamping and balloon activities! What wonderful ways to bring a special book to life for your child! I always admire your creativity and passion! Oh what a great set of balloons and paintings! 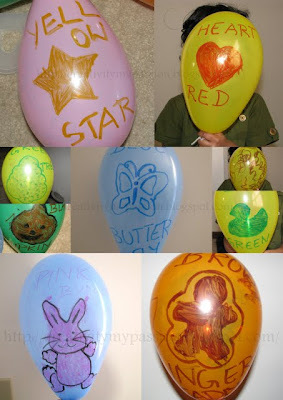 Especially like the paint a balloon before it is blown up idea! Such a crafty session you all had! Thank you so much for stopping by and linking to Kids Get Crafty! Lovely to see you there! Looks like a bunch of fun! What fun ideas!! I love them! Thanks so much for sharing this with For the Kids Friday! I've just posted the next link party. I'd love to have you stop by and join in the fun again this week.